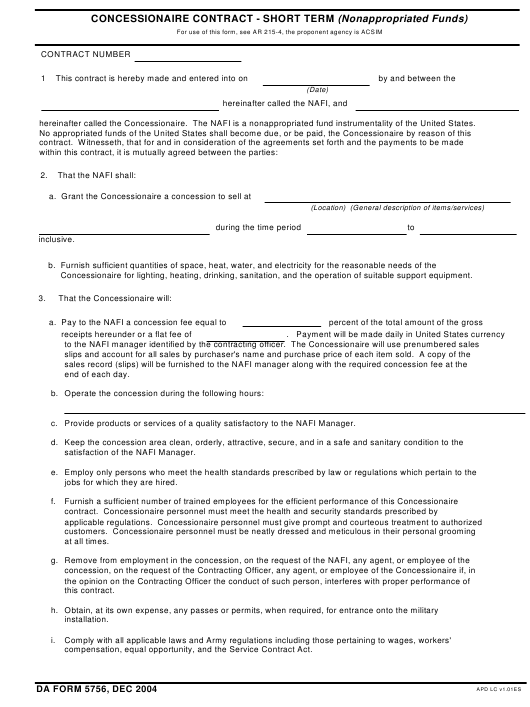 DA Form 5756 - also known as the "Concessionaire Contract-short Term (nonappropriated Funds)" - is a Military form issued and used by the United States Department of the Army. The form - often mistakenly referred to as the DD form 5756 - was last revised on December 1, 2004. Download an up-to-date fillable PDF version of the DA 5756 below or request a copy through the chain of command. hereinafter called the Concessionaire. The NAFI is a nonappropriated fund instrumentality of the United States. Concessionaire for lighting, heating, drinking, sanitation, and the operation of suitable support equipment. Provide products or services of a quality satisfactory to the NAFI Manager. satisfaction of the NAFI Manager. jobs for which they are hired. compensation, equal opportunity, and the Service Contract Act. the NAFI, its successors in interest and the U.S. Government from any liability the NAFI or U.S.
Concessionaire's agents or employees on or about the military installation. flood, and damage or destruction through any force of nature or otherwise. be excluded from the computation of gross receipts in the determination of the fee payable to the NAFI. by State law or regulation, the Concessionaire will obtain and conspicuously display the State sales tax. pricing or consideration through error or otherwise, the concession fee shall be correspondingly adjusted. concession fee shall be correspondingly adjusted. the price schedule and collected from the customer. United States or the NAFI. Sell or remove any NAFI or Government-owned property. or elsewhere on the installation. concession premises or elsewhere on the installation. Sell merchandise or services on credit. 8. We the undersigned, have read, understand, and agree to the above terms and conditions.